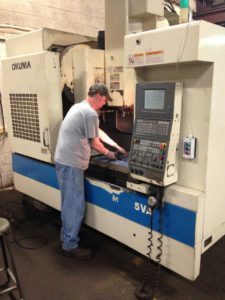 Gateway Metals Purchases Okuma CNC | Gateway Metals, Inc.
Gateway Metals recently purchased an Okuma CNC for its Machine Service Department (MSD). Gateway Metals can provide its tool steel and mold steel customers bar lengths, saw cut pieces, or squared up blocks depending on their needs. Gateway Metals, Inc. (GMI) is an independently owned and operated full service tool and mold steel distributor located in St. Louis Missouri. GMI’s inventory includes A2, D2, S7 MQ, 4140 Holder Block, Premium H13, and CPM steel. GMI’s services include non standard sizes, precision ground bar and precision ground blocks. With over 200 years of combined experience and a 24 hour operating schedule, Gateway Metals is able to service its customers very quickly from quote to shipment.